He’s won two graded stakes. He’s trained almost exclusively at Belmont Park and Saratoga Race Course since mid-May. And yet Mission Impazible has yet to race in New York. 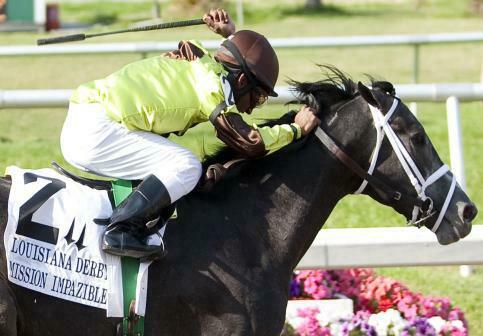 That is all expected to change when Mission Impazible competes in the Grade 1 Whitney Invitational on August 6. Trained by Todd Pletcher for Twin Creeks Racing Stables, the son of Unbridled’s Song won the 2010 Grade 2 Louisiana Derby and this year’s Grade 2 New Orleans Handicap, both at the Fair Grounds, and was second by a neck after leading in the final stages of the Grade 1 Stephen Foster Handicap at Churchill Downs on June 18. The August 6 card will also include the Grade 1, seven-furlong Test for 3-year-old fillies, in which Pletcher plans to send out Her Smile, who won the Grade 1 Prioress at Belmont on July 4. Previously trained by Leigh Delacour for owner William M. Backer, Her Smile was purchased by celebrity chef Bobby Flay following a second in the Grade 3 Comely at Aqueduct Racetrack in April. Subsequently transferred to Pletcher, she finished 11th in the Kentucky Oaks at Churchill Downs in May and third in the Grade 1 TVG Acorn at Belmont in June prior to her breakthrough victory in the Prioress. The six-furlong Prioress was Her Smile’s first race in a sprint since November 2010, and Pletcher sees the Include filly remaining at abbreviated distances going forward. “We want loads of pace in front of us and to come from off the pace,” said Pletcher.